Today's TastingTable talked about Essential Cane's new line of flavored sugars debuting at the Spice Station this weekend, with delicious sounding flavors including "dark purple blueberry or rosy red raspberry sugars." But what really caught my attention was the mention of a sweet onion sugar, which adds a rich caramelized onion flavor to dishes. Now this is something I have to try. Plus they look so pretty. So I've started doing some research, and I think I'll start out my testing with some basic sugars, so I can get the formulas and textures down pat, before moving on to the exotic. Here were a few recipes that seemed easy enough, yet amazingly tasty. Cut the dried vanilla bean into half inch pieces, for easier grinding. Grind the barley and vanilla bean in spice mill or coffee grinder until fine. Stir into sugar and store in a sealed container. 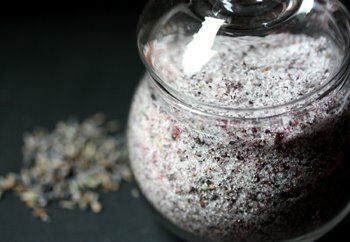 In a spice mill or coffee grinder, process blueberries and lavender until fine and powdery. Mix well with sugar and store in an air tight container. Use the packet of desiccant from the freeze dried blueberries or pilfer one from an empty vitamin bottle to prevent clumping. Preheat the oven to 300 degrees. Place the zest, rosemary and sugar in a small food processor bowl and process until fine and ingredients are all well distributed. Spread the sugar out in a baking pan and toast for about 20 minutes or until zest and herb fragments all seem completely dry. Cool and store in an air tight container.